This is my daughter Kylie. 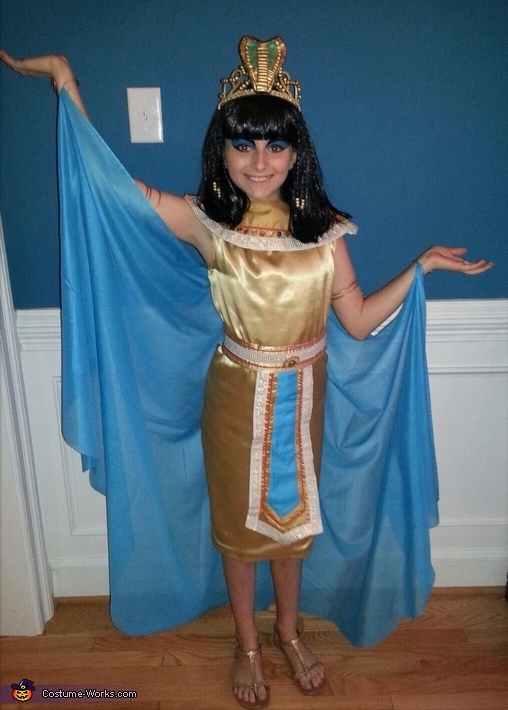 She wanted to be the Queen of the Nile. This costume was pretty simple to make. It took me 7 hours to make it. I made the crown by purchasing a plastic tiara and then molded the cobra and baked it. I glued the snake on it and primed and painted it. The dress was simple to see. The belt and the top collar piece took the most time. I made the arm and wrist bands about of jewelry wire. I bought the wig and cut it and added gold beads. The sandals were primed and painted gold. I don't use patterns, I just go by a dress she can currently wear.